I couldn’t find an mp3 player that did what I wanted, so I decided to try to make one. I have not used a Raspberry Pi before, but this is my first attempt. 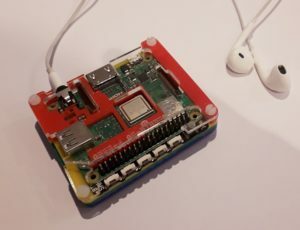 I bought a Model 3A, a Pibow case and a Button SHIM from Pimoroni and wrote a simple Python script to connect the buttons to the excellent OMXPlayer. The good thing about OMXPlayer is that is plays everything and has a Python wrapper. The Button SHIM (shove-it-in-the-middle) adds some buttons and LED’s without removing the GPIO.